This article narrates how a school implemented the six Edward de Bono Thinking Hats as an effective tool to develop thinking skills from early years to grade 8. We felt that it was an appropriate choice to implement thinking, analyzing and problem-solving skills across our entire curriculum and three programmes at the school. The six Edward de Bono Thinking Hats are not just a theory put forward by de Bono, but are also seen in practice every day at NSS Hill Spring International School. Evidence obtained by the de Bono Foundation suggests that his tools have a positive impact on academic achievement and behavior. The Six Thinking Hats are colour coded and offer our learners a framework to problem-solve and explore ideas. It is a simple, effective lateral-thinking process that helps learners become more productive, focused and “mindfully” involved. The hats are displayed all over the school, and are used every day during different events, be it in the classroom, during student-led conferences or school assemblies. The hats are displayed in different focal areas around the school as a constant reminder to learners that the hats are an important tool and should be implemented daily. During the student-led conference session in senior kindergarten, the blue hat was used to manage the thinking process. In this activity, the learner matched the pictures in the bowl to the image on the card. Learners in grade 5 used all the Thinking Hats to understand and explore the concept of fractions. The learners took turns to use all six hats and shared their thoughts about the process. Through this process, they were able to comprehend the concept much better. While a learner was wearing the red hat, he said that he felt scared and worried as to whether or not the answer was correct. Another learner wearing the black hat said his weakness was identifying the correct sign, in the problem given. 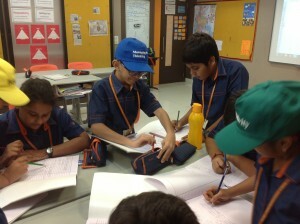 Mathematics – Grade 5 students collaboratively analyzed the mathematics problem and gave solutions. 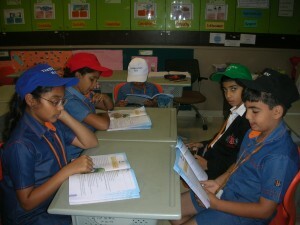 Grade 3 used the hats during an English class where learners had to form groups of three. They were then given a poem, an essay or written expressions which had to be read and then connected to a particular hat. They were given the opportunity to formulate questions that could be connected to the hats, and then had to present their questions to the class while justifying why they had chosen that particular hat. 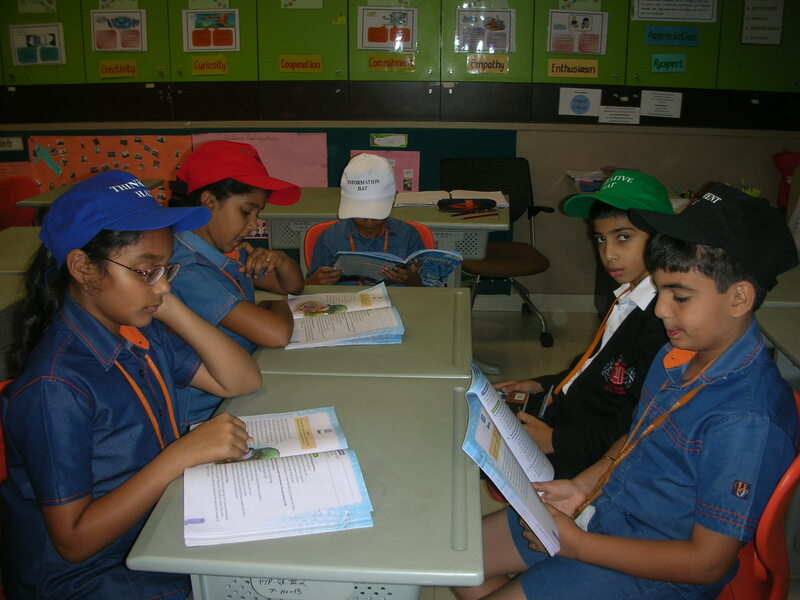 Language – Grade 3 students trying to comprehend the poem and prose for a better understanding using the Thinking Hats. These were the questions asked by our grade 3 learners, after listening to the story The Story of Sindbad the Sailor from the Snowflakes Reader -3 (Cambridge University Press). Green hat: Why is creativity important? Black hat: What profile will you give Hindbad and Sinbad? White hat: Where is Hindbad from? Red hat: How did Hindbad feel when he saw the great mansion? Yellow hat: What form of communication can be used to communicate with someone without talking? Using the hats to understand the different perspectives of bullying, grade 4 staged an informative presentation for their parents in a court-room setting. This was done through several exercises of freeze frames that were followed by group discussions. Students shared their personal experiences of being bullied at home by siblings, in parks by friends or outsiders and on the school bus by peers. They realized that most bullying incidents have a bully, a victim, and a witness and that the bully is seldom alone. 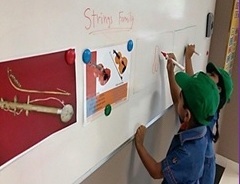 Music – Junior Kindergarten students identifying the musical instruments. Junior kindergarten learners researched the folk music of India. From the state of Rajasthan, they learned the story and history of a musical instrument called Ravanhatha, the first violin, created 5,000 years ago. The learners used the white hat to identify and recall information as well as to organize facts and ideas about Ravanhatha. They used the blue hat to determine and draw conclusions about how it may have travelled from Sri Lanka to Rajasthan. They chose to illustrate their information about the origin of each part of the instrument. They used the green hat to design a futuristic violin. The learners who wore the black and yellow hats examined their peers’ designs to point out the pros and cons for each idea. Six Thinking Hats has proved to be a powerful tool that facilitates critical thinking, collaboration, communication and creation. It enables our learners’ unique points of view to be included and considered. Our learners think thoughtfully now before speaking, present their ideas confidently, and make informed choices. Our learners love thinking about thinking! They enjoy the simplicity of the hats and can easily and purposefully examine all approaches to problem-solving. Six hats has provided us, as facilitators, a way to create a more multi-sensory learning environment, giving our learners a greater chance for success. 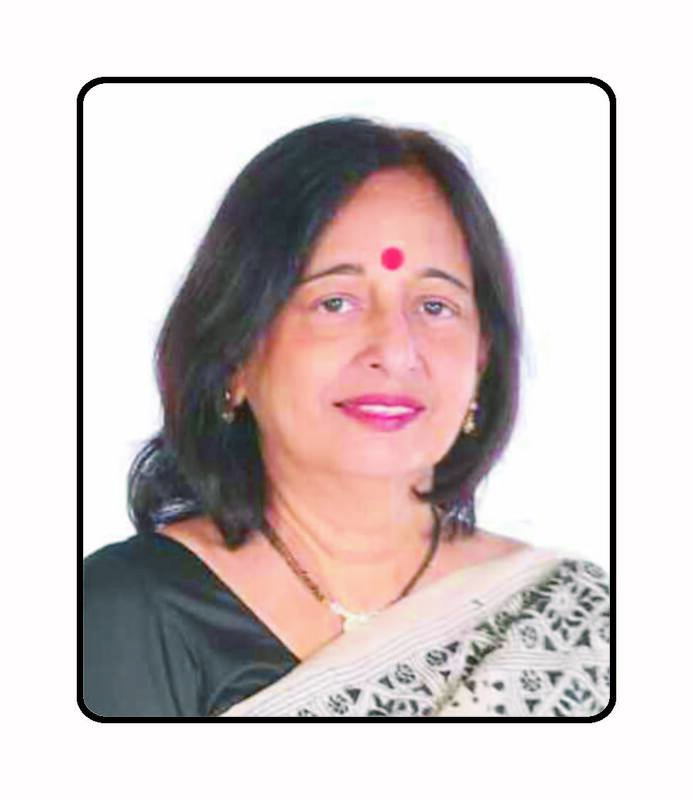 Nalini’s passion and abiding interest in thinking and application skills is evident through the curriculum in the IB programmes at the school. 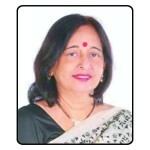 She strongly believes in engaging young learners by continuously introducing newer techniques and strategies that are woven into the school’s three programmes year upon year. Edward De Bono’s Thinking Hats were introduced in a purposeful manner because she found a close and strong connection with the IB philosophy of developing thinkers, inquirers and reflective life-long learners. Resulta motivante para los niños utilizar estos sombreros… Y siempre quieren uno distinto…así aprenderán muchas cosas de diferentes formas! !